Warming temperatures are prompting many trees in temperate regions to put on leaves in the spring earlier than they have in the past. Climate change models predict continued warming of up to several degrees C by 2100. 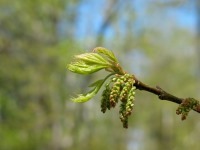 A team of researchers at Princeton University, led by David Medvigy, developed a nuanced model to predict the timing of leaf-out in the future. This team tested how well the model performed by comparing the predictions of leaf-out of several species of deciduous trees from recent years to observations that Nature’s Notebook participants had reported for the same species. The team’s projections suggest that by the end of the century, trees will leaf out in the spring up to a month or more earlier than they do presently, but that trees in northern latitudes will show a greater advancement than those in southern regions. This will result in a shorter span of time between leaf-out in the south and the north than we currently experience, which could affect interacting plant and animal species as well as global carbon cycling. This research was published in the journal of Geophysical Research Letters and represents the first peer-reviewed publication incorporating observations of phenology collected through Nature’s Notebook.